Learn all about the drone rules in the Philippines. You may use your drone for private purposes in the Philippines. It is much more complicated if you pursue commercial interests. Maximum flight altitude: A drone can climb up to 120 meters (400 feet) in the Philippines. Maximum horizontal distance and FPV: You must operate your drone within the visual line of sight. Compulsory insurance: We recommend protecting your flights with a drone insurance which bears the costs for third-party damages. Maximum take-off weight (MTOW): Without prior approval, you can fly drones up to a take-off weight of 7kg. Distance to airports: The distance to airports must always be at least 10 kilometers. Other safe distances: A minimum distance of 30 meters must be observed to uninvolved persons. Flight bans: The operation of unmanned aerial vehicles in a populated area such as schools and marketplaces is not permitted. 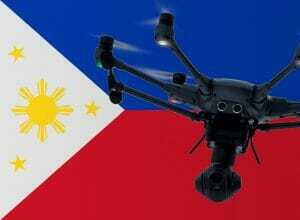 Time of operations: Drone flights during the night time are not allowed on the Philippines. Regulations for commercial pilots: A licensing at the Civil Aviation Authority of the Philippines is necessary for commercial flights. For this, several tests must be completed and appropriate flight experience must be demonstrated. Good to know: A new regulation of the law has been expected for a long time. So be prepared for your trip that something could change quickly. We have researched the listed drone regulations for the Philippines to the best of our knowledge. We can not guarantee the correctness of the information. If you want to be on the safe side, please contact the competent aviation authority. Alternatively, you can also ask the embassy in your country for further information about the regulations. Please leave us a comment when you receive news and/or gain experience with your copter on the Philippines! Anyone with experience bringing a Mavic Pro into the Philippines (Cebu) through Hong Kong? Thanks! I did not bring through HK… but Singapore and I had no problem at all. I contacted them first to make sure. You should be fine, but please don’t take my words for granted. Just double check. I am planning to go to the Philippines shortly for a vacation with a drone. I just want to know the basic regulations or documents required for the same. Any advice would be appreciated. Thanks. And got this message back today. Maximum take-off weight is below 7 kg. Any drone as heavy as 7 kg and more is considered as a “large RPA” and requires licensing. This link shows the latest regulations as far as I know. Just took a look at the YT link from Ignat… which confirms my findings. I am a US Citizen. My wife is Filipino. We prefer to live in the Philippines. I currently hold the US FAA Part 107 commercial drone pilot license. Would that hold any credentials or do I have to go through the whole process and if so how long does that take? Scott, have you read the document referenced in the post directly above yours? Scott – I am afraid that your license will not hold much water here in PH, as a PH license would not be acknowledged in the US. But regulations here are comparatively droner-friendly. If you don`t use your drone commercially and is below 7 kg, you have only to watch for basic rules and regulations, as no night flights, no flights over crowds and populated areas, airports within a 10 km area and not above 400 feet hight. Thanks Francis for all this bullet points precious information, have a nice trip. I’m a Filipino and I have a 4 Day Vacation plan to Melbourne Australia this coming August 2018. Some of my Friends Say that it is Okey to bring Hand Carry with me my DJI Mavic Air, Do I need to Register or Apply anything please let me know. BUT. You’re not allowed to fly your drone in Boracay anymore. At least not at the beach! Started it again later from within the Resort,- no problem. I am just a hobbyist do I need a license to fly drone in provinces or remote areas in the Philippines?